A great evening with half a dozen entrepreneurs and IT experts in California. Smartphones are very quickly becoming an important business tool and they are absolutely ideal for the onsite Computer Technician. In this article, I would like to share with you some iPhone applications that Computer Technicians use in their businesses. If you have a Blackberry, Android or Windows 7 based smartphone, please list the applications that you make heavy use of (and the device you are using) in the comments below and I will include them in the next Smartphone app article. I always had wondered how good a remote desktop application could be on an iPhone with its small screen. I tried out the free version for use on my own machines and found the speed to be very impressive. I was testing it on an iPhone 3G which is one of the older iPhones over the 3G network which can also be slow. I was really impressed with how well it ran. It is free for personal use but you need to pay for the Pro version if you are using it to support any clients. LogMeIn Ignition allows you to directly control one or more of your computers anywhere. It has a different interface to Teamviewer but they both work great on an old iPhone 3G over the 3G network. iSSH is effectively several clients in one, containing functionality for ssh/telnet/raw connections, an X11 server and VNC tunneling. iSSH supports multiple, simultaneous connections with more complete terminal compatibility, more configurable macro and key options and an intuitive UI. Computer Technicians do a large amount of driving going onsite and use up a lot of petrol. Luckily, the petrol that you use to get to your clients house would be considered a business expense so you can you can get a tax deduction or reimbursement. Trip Cubby is an application designed for anyone who needs to track mileage for tax reasons. It was designed with IRS compliance in mind and allows you to export the information as a CSV file via email. I mentioned Squareup on Technibble a while ago when I wrote about accepting credit cards. Squareup is a service that allows you to accept credit card payments onsite by turning your iPhone/iPad into a credit card reader thanks to a small attachment. Scany is a powerful multifunctional networking instrument for finding connected devices, looking up detailed device information, network troubleshooting, scanning ports, testing network security and firewalls. Scany offers lots of useful tools in addition to its primary feature of scanning your Wi-Fi, LAN or any other network and providing detailed information about any device connected to it, its domain and network names, addresses and vendor. Scany also includes a whole set of networking utilities such as ping, traceroute, remote wake (WOL), Whois, Geo IP and shows information about active network connections along with the external IP address of your router. BSOD: Stop Codes is an application that provides indexed information on Microsoft Windows (blue screen) stop codes. This application allows you to lookup common stop codes that can be found on the MSDN web site provided by Microsoft without the need for an active cellular data or wifi network. Dropbox is an incredibly useful and powerful service that allows you to sync files between computers and devices. Dropbox is so well known that many other applications also allow you to syncronize the data made in that application with your Dropbox account. You can create a free Dropbox account here. Aplayer is an application designed to allow the user to view their IP based security cameras from their iPhone. I have heard of some Computer Technicians using it to keep an eye on their technicians in the shop while they are onsite. 0 0The application Newegg is exactly what you expect it would be, Newegg for the iPhone. The application provides you with an iPhone optimized layout of the website which is great for onsite price checks. 1 1Just like the Newegg application, its Amazon for the iPhone. Again, great for quick onsite price checks. Dont forget, many Client Management solutions also have web option which allows you to access it on a mobile device. CommitCRM is a desktop application but also runs a web server allowing you to access it via the internet. mHelpDesk has a native iPhone application and ShopManager is a web based application so you can also access that via you mobile browser. You can also make a shortcut link to your CRM appear on the main page of the iPhone. If you believe I missed any great iPhone applications for Technicians that are worth a mention, please leave us a comment. If you have a Blackberry, Android or Windows 7 based smartphone, please list the applications that you make heavy use of (and the device you are using) in the comments below and I will include them in the next Smartphone app article. In this day and age most Technicians make use of a Smartphone in their daily lives. I use my own Smartphone mainly when I need to research some information while on the job or when I am waiting in line at the Bank or something similar. 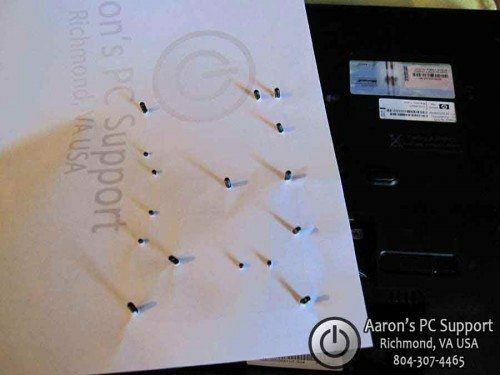 The Cheapest Laptop Screw Management System – That Works Great! 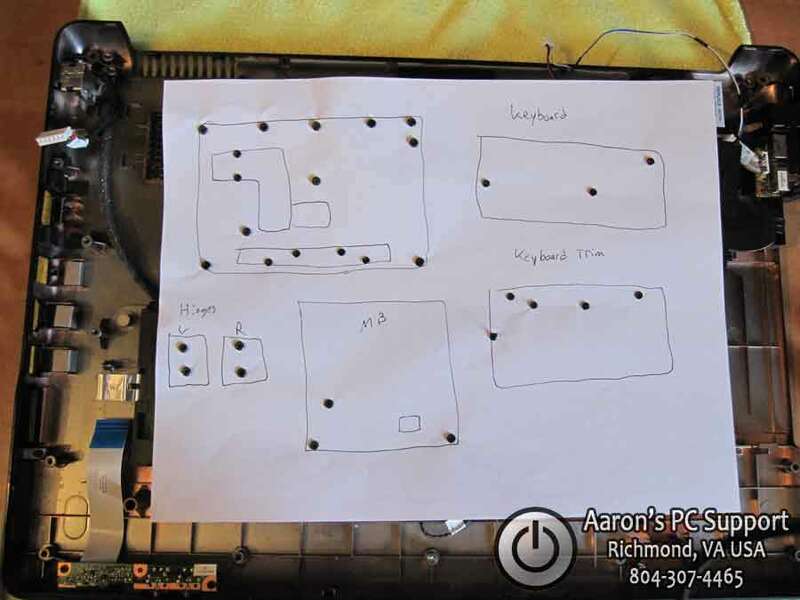 One of our Technibble forum members shared with us a fantastic way to organize screws when disassembling a laptop. The need to organize laptop screws comes from the fact that there are many screws with many different sizes and lengths depending on which part it came from. 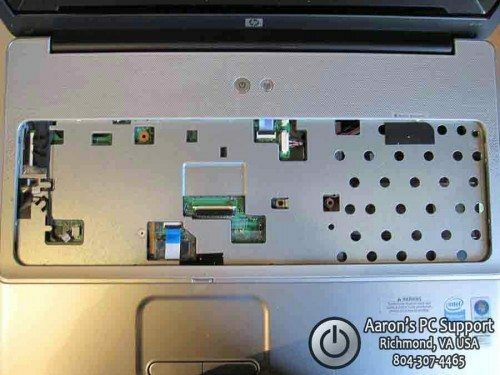 Getting the laptop apart isnt the problem, but knowing which type of screw went where when putting it back together is. Its incredibly frustrating to have left over screws when you put the laptop back together again and then trying to figure out where it came from. This is one Technibble members solution to the problem. I have tried different screw management techniques and nothing has been as cheap, fast, and perfect as this. I have never had extra screws or mix-ups during re-assembly. 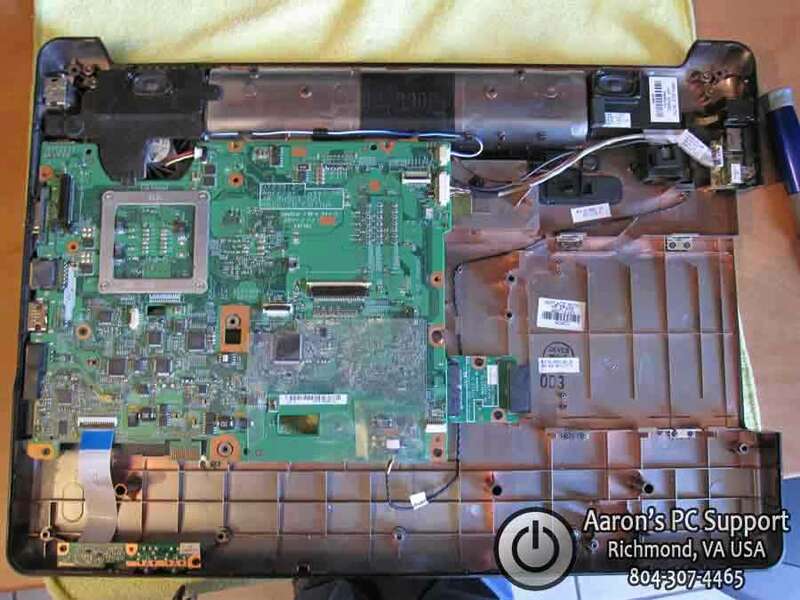 In this example this HP laptop has a broken DC power jack which will require the laptop to be taken apart completely. First, you will need a plain sheet of 8.5 x 11 paper, a towel (microfiber prefered, or other soft top as not to scratch laptop lid), a pen, screwdriver, and a small Awe. Next, we need to remove all of the covers and hardware from the bottom of the laptop. This will expose all screws that may be hidden. Be sure to place all of your parts into or on an anti-static bag of some sort. Now we can see all of the screws that need to be removed. 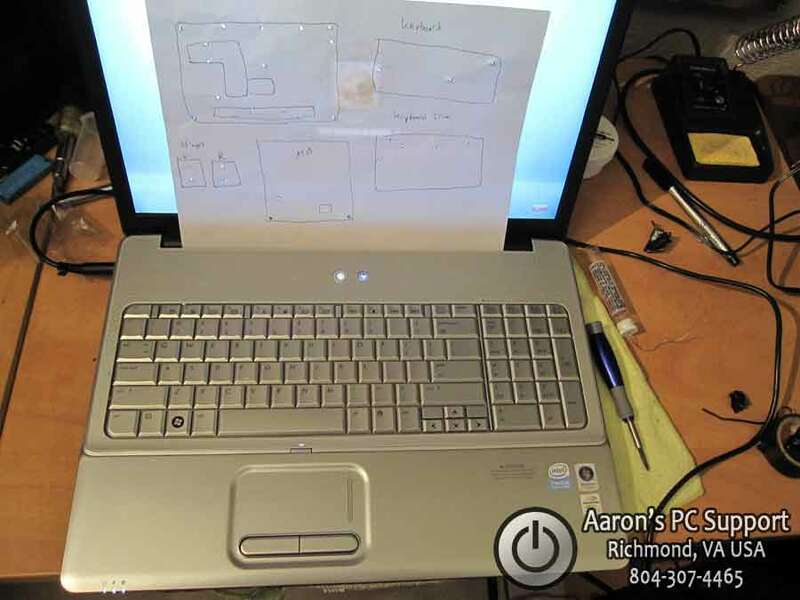 Start by taking your blank piece of paper and drawing a rough outline of the bottom of the laptop. I like to draw basic features such as the battery bay, cover locations, as to give a orientation reference as we move along. 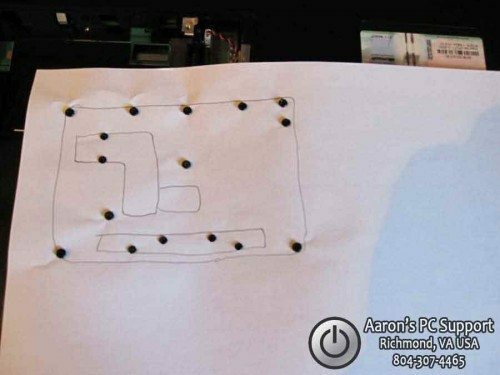 Now punch holes into the paper where you have screws drawn. It is important to punch the holes with an Awe or something similar. Not punching a small hole, and then inserting the screw will rip the paper, and the paper will not hold the screws tightly.. which means you will probably lose one. To make punching real easy: place the rough outline paper on a towel, then punch. We don’t need any bloody fingers. 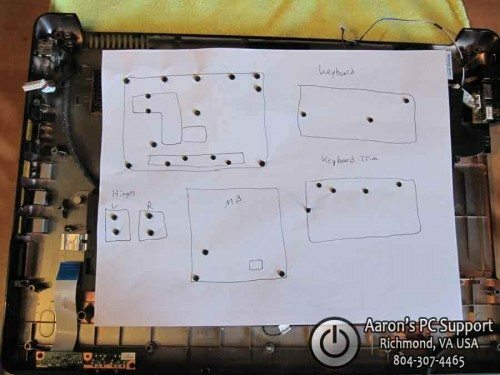 Next, remove all of the screws and punch them into the oppropriate spots on the paper. Here, you can see the paper is upside down, and all of the screws are held securely in place. 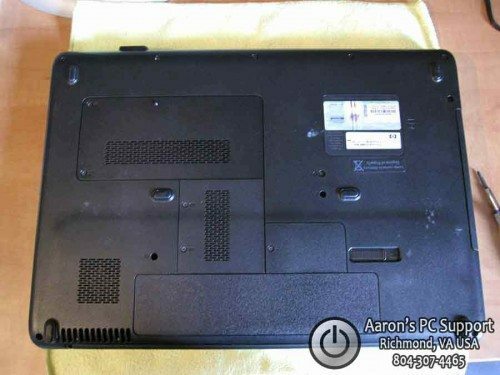 Now we flip the laptop over, right-side-up, and remove the keyboard and keyboard trim ring to reveal some more screws. So I draw another simple sketch and punch some more holes. I also punch holes for the LCD hinge screws as well. Now we can remove the top cover of the laptop to reveal the motherboard and some more cabling. Now is a good time to draw a diagram of the motherboard, punch, and remove and place the screws in the paper. Now it is easy to reassemble the laptop and place the screws into the correct positions… another job well done! I hope this helps some of you out there using pill bottles and other methods that “lump” together a bunch of screws that may be slightly longer/shorter or fat/skinny. 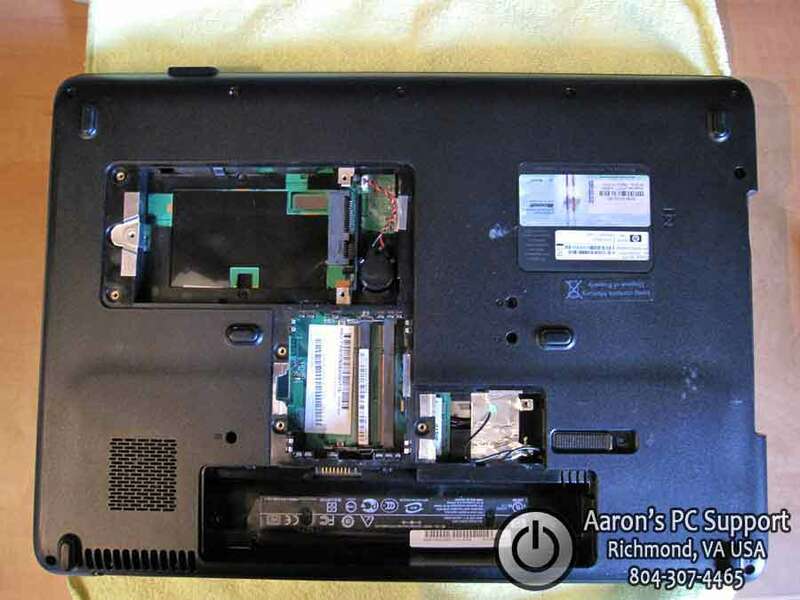 If your repairs didn’t go as planned, you still have your paper so you can disassemble the laptop again if needed. 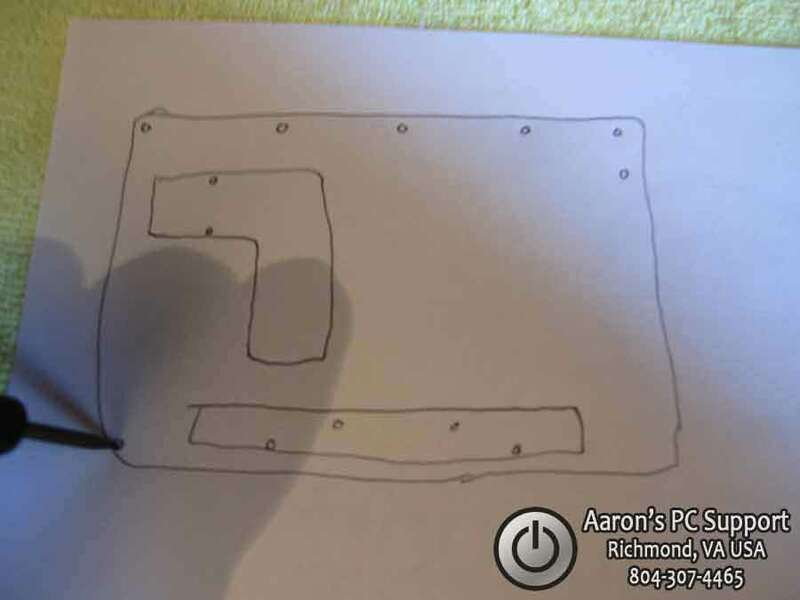 Special thanks to Aaron of Aaron’s PC Support for sending this in. 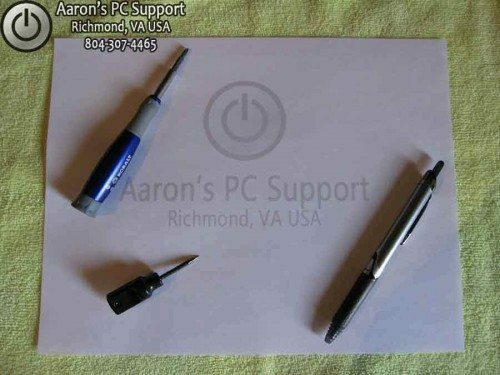 Aaron’s PC Support is an affordable computer repair shop with over 20 years of experience. Aaron’s PC Support provides alternative low-cost computer repair services for Central Virginia; Richmond VA, Chesterfield VA, Midlothian VA, Chester VA, and Henrico VA. If you want to learn how to repair laptops including how to disassemble them, check out Podnutz’s Laptop Repair Videos. To get started with your own computer business, check out our Computer Business Kit. The Cheapest Laptop Screw Management System – That Works Great! Guest Post by Lisa Hendrickson, Owner of Call That Girl. Lisa has published her proven social media strategies in her latest eBook, "Call That Girl’s Guide to Social Media". Lisa has been a featured writer for Technibble in 2010 and is a contributor in the Business and Marketing forums. Everyone is talking about social media lately and the craze doesn’t seem to be going away. If you’re not utilizing it in your business marketing plan, you might feel like you’re behind the times. Many people who are not using it, don’t know how to even get started. As it is one of the top marketing strategies I use for my business, I found it to be easy to learn, affordable and not something I needed to outsource. You can do it yourself and start seeing results in one day by following these 5 starter steps and these 5 action steps. 1.) Collect your contacts emails. Go through all of your emails, client databases, email accounts and create a generic list. An excel spreadsheet will work fine or use notepad. 2.) Create a LinkedIn profile (http://www.linkedin.com). It’s recommended you use your real name for your profile, not your business name. Fill your profile with your credentials and as much information as you are comfortable sharing. Most people on LinkedIn share most of their career highlights, past positions and skill sets. Of course there is more to using LinkedIn than just creating a profile, but this is a good start. 3.) If you have a website, add a blog page or sign up for a free blog like http://www.blogger.com. 4.) Start an email marketing program. Many popular email marketing companies have free 30 or 60 day trials. For 2011, I am using Constant Contact. 5.) Upload the emails you just collected to your email marketing program and LinkedIn profile. You will need a few contacts to build your network and to have people to send your email newsletter to. Those are the 5 easy steps to get going, here is your action list. 1.) Write a blog about a simple value-add tip you know of about your industry that others would enjoy learning about. (Example: Tips for buying a new computer). 2.) Create a newsletter with a welcome message, a blog tip (the one you just blogged about) and offer a coupon or discount for services. Be sure to write a short paragraph about the blog and then in the newsletter, put in a hyperlink to the blog to encourage folks to go to your website or blog to finish reading the story. Remember to track the analytics of the newsletter. 3.) Join your local city and state groups on Linkedin. After you join these groups, be sure to introduce yourself to the group. After you have done that, post your blog link “Tips on buying a new computer” in a new discussion. A tip for being effective on LinkedIn is to make sure that your discussion is not pushy or gives the appearance of spamming the group. Try to peak the interest of the members with hopes they read it and remember your discussion later for if they need your services. It’s a good idea to use your professional signature with all discussion postings. 4.) Invite members of those discussion groups to your LinkedIn network. (These are all potential new clients as everyone on LinkedIn has a computer available to them). Many of the people in these groups have the potential to be commercial clients and of course, they are all residential clients. 5.) Attend local face to face networking events. Many of your LinkedIn groups will have free or low cost events. Be sure to watch for those and attend. Meet as many people as you can and when you get home, invite them to your LinkedIn network and add to your email marketing. Meeting new people in person is a very important factor to winning big with social media. I hope these 10 steps will help you get started with social media. If you would like to learn more, my latest eBook will help you with step by step instructions. Works on Windows XP, Windows 2003, Windows Vista, Windows 2008 and Windows 7. The Association is pleased to begin the New Year with over 1,300 members and a membership base that continues to grow. We currently have members in about a dozen different countries. 2010 was a very good year for the Association not only due to the increase in membership but also with bringing in quite a few Preferred Vendors to the Association for the members to select from. Some marketing companies were brought in along with a few online backup solutions for our members. Today we are going to talk with an IT service provider who opened his own computer store, learn how he did it and what you need to consider before making that move from working out of your house to opening a storefront of your own. OnForce suddenly and unexpectedly removed a number of techs from their forums and disabled their Provider accounts on the platform December 29. Read An open letter to all Force Field members For full commentary. Today we are going to talk with Pat Palmer of The Computer Guy and learn how he opened his store. We’ll discuss how he made the decision to jump from a home office to an actual storefront, the considerations he made in staffing it properly and why a daily commitment to attendance and punctuality is vital to its success. Part one of a six part series.